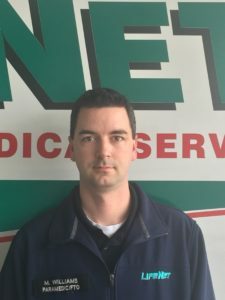 Matthew “Matt” Williams is involved in multiple aspects of LifeNet’s EMS service in Stillwater, Oklahoma; including new employee development, our quality assurance processes, education, and multiple leadership roles. Matt completed his paramedic education at Oklahoma State University, and is pursuing a B.S. in Emergency Medical Services Administration at Columbia Southern University. When Matt is not at work, which is a rarity, Matt spends time with his wife, Felisha, and their seven children. Matt and his family enjoy fishing, traveling, and attending various sporting events. Matt is LifeNet’s 2017 Star of Life representing our Stillwater, Oklahoma division. Matt’s coworkers nominated him for his dedication to our patients, the community, and for his commitment to the LifeNet team.